The MK1 Mazda MX5 - a classic design from the past, which wants to be driven hard in the present and is an investment for the future. While we try our best to keep this page up to date, you're always better to call us any day of the week on 07780468805 or 01361 883727 if after 6pm, or complete our contact form. Its been a long time coming but we have finally found a solid unmolested​ and rot free Eunos that has been dry stored for over 3 years. It is now in our workshop and will undergo a complete ground up restoration. ​It is a perfect opportunity for its new owner to choose the final specification for this car including wheels, brakes, exhaust, hood and interior. Picture shows the car as it was delivered to us. Customers car purchased from us a couple of years ago and now being offered for sale. It has taken us over a year to finally find a rot free and unmolested Eunos that would warrant a ground up restoration. The above picture show the car as it came off the delivery truck. The car was imported in 2007 and has been dry stored and not used for over 3 years. When the car was imported it had 99,500 km on the clock and now it reads127,000 km so if you take off the 3 years it has been off the road, it has covered less than 1,900 miles per year. We suspect that those were all dry miles as the underside of the car is really in superb original condition. The pictures below show the underside of the car and the areas that are usually very corroded. Normally we would put a large number of new parts on these restorations, but the car is in outstanding condition and does not warrant replacing our usual items, also it will allow us to keep the costs down to make this an affordable restoration. Such items as the callipers are reasonably new so we shall just clean and service them along with flexi pipes, master cylinder and clutch cylinders. The hood is also in good condition and the seats are like new and so clean it is quite astonishing. Front wings are also good so we will re-use these. We have a set of quite rare Enkei RP01's with as new Nankang tyres so these will be powder coated, probably in gold to contrast the Laguna Blue although this will be left till the end so our client can choose there preferred colour. Where ever possible we shall endeavour to keep our costs as low as possible without compromising our high standards. Client can have a choice of wheels, exhaust, brakes, interior and anything that they would want to change from standard i.e. shocks, induction etc. Below are other photos as the car is plus ​a few showing how the subrames and running gear will be when finished. Underside of the car has been pressure washed and all loose and flaking unders​eal has been removed. Where the bare metal has been exposed, it has been rust treated - then 2 coats of underseal. You can see from the finished result how good the underneath of this car is. Those who are very observant will note the drain hole tubes have been removed so that we can make sure they are completely clean before replacing them back in. Photo shows a few of the wishbones after being acid dipped which removes ALL rust from the components. As you can see they are now like new and will have rust prevention treatment before being ​sprayed with Epoxy Primer then Acrylic two pack Black paint. We do this instead of powder coating as we find that when powder coating is hit by stones, water then gets under the coating and it lifts off very quickly - therefore we prefer acrylic paint. Body shell and fittings are now ready for the Epoxy primer and should be ready for top coat by the end of the week. 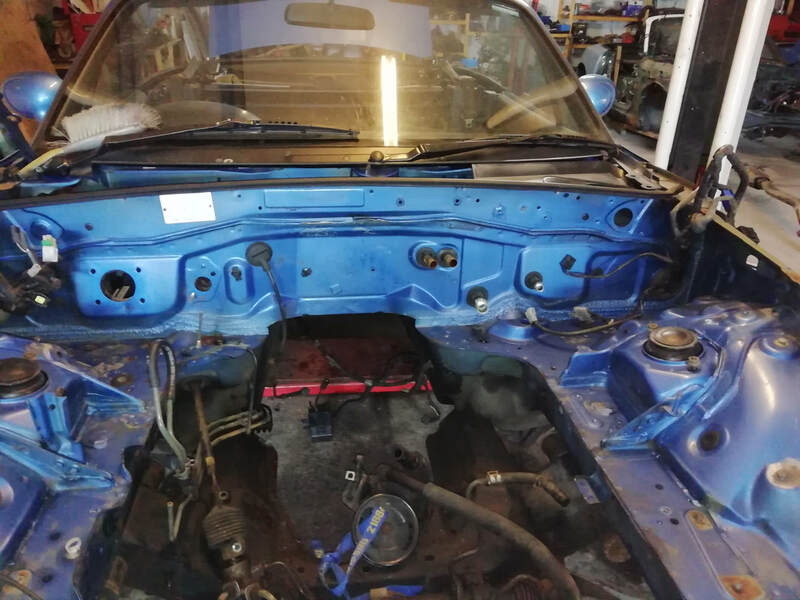 If no-one has expressed interest in ​​having this car finished in a particular colour, then it will be painted Laguna Blue and finished as a standard 'S' Special would have been when leaving the factory. 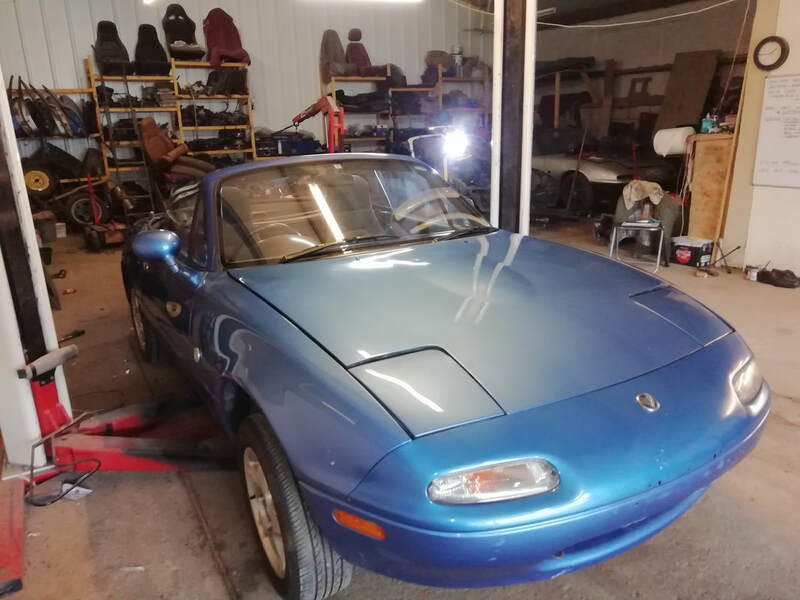 We are listing this car on behalf of our customer who bought this cr from us about two years ago but in that time has covered very few miles but has been extremely well cared for as you can see by the photos. A desirable edition of an imported 1.6l Eunos Roadster, this example of a good condition V Special is black with a black soft top and BBS alloy wheels. The interior is finished in the V Special tan (leather seats, carpets and trim), with a wooden handbrake and gear knob, and has a leather steering wheel. It is fitted with a detachable Sony radio/CD player, power steering, electric windows, air conditioning, headrest speakers, stainless steel sill tread plates, a stainless steel exhaust and a factory-fitted immobiliser. First registered in the UK in July 2005, the car has a 1597 cc, petrol engine, a 5-speed gearbox and has 189 872 km (117 980 mls) on the clock. Modifications include a Jasma 4-branch manifold and KYB adjustable shockers. Mechanically, it has been well-maintained and runs very well. Its MOT is through to 10th November 2019.